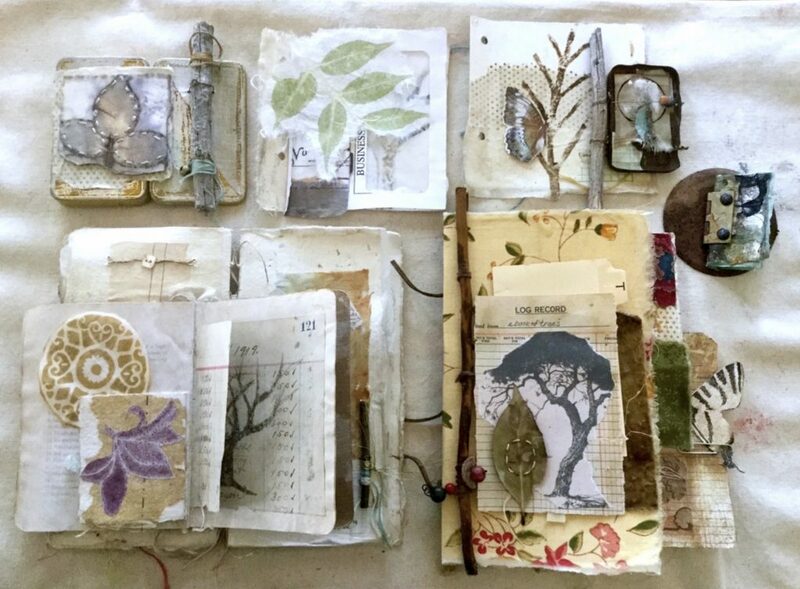 We are so thrilled to announce that author and mixed media and collage art professor Roxanne Evans Stout is offering her newest online course on our creative network! No matter what season it is right now in your neck of the woods you will not want to miss Book of Trees! Handmade books, stitching, stamp making, collage and more. In this class, we will delve wholeheartedly into the theme of trees and create a unique mixed media artist book that you will treasure forever! I have always loved trees. As a little girl, I would sit under a large eucalyptus tree on the front lawn of our apartment in Santa Monica, California. I would read or work in my journal, writing, and drawing… even making nature observations- things I still love. Back then I longed to live in the country surrounded by trees. Now I live in a small country town in Oregon, and my family and I have planted many trees on our land and watched them grow and thrive alongside us. The gifts a tree can give are endless… their beauty, their strength and resilience, the way they provide us food and homes for wildlife, and the way they clean our air. 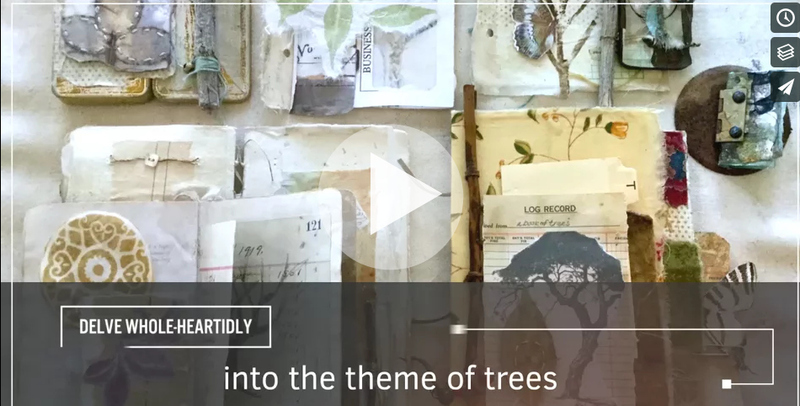 Won’t you join me as I guide and inspire you in the making of a handmade book… inspired by and celebrating your connection to trees? Together we will collage with papers and fabrics, create textures and layers, and play with color. We will carve and print our own stamps and use images and quotes on the pages of our books. We will stitch and attach beautiful treasures from nature with threads and wire. I will share with you my creative processes and favorite techniques that will add magic to your pages and I’ll share writing prompts to further your journey of honoring trees. 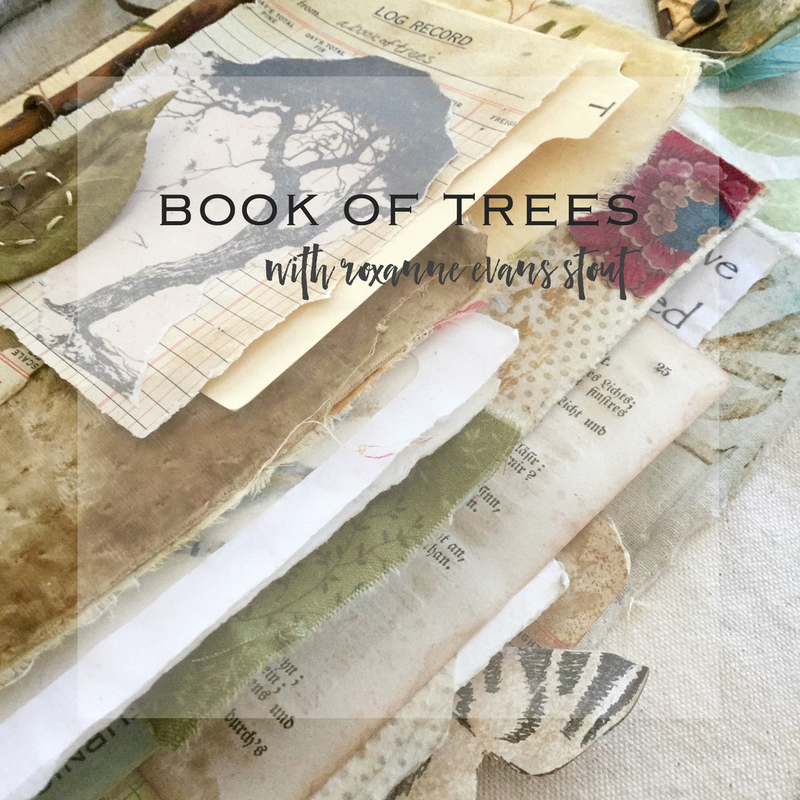 You will see how… day by day and moment by moment…your handmade book will evolve into a rich compilation of pages that is your very own Book of Trees. I live and create in the beautiful Pacific Northwest. The mountains, the river lands and the wildlife that surround my home are my constant inspiration and show up in all of my creations in some way or another. I teach workshops internationally and my work has been shown and hangs in homes throughout the world. I’m very honored to have been published in many wonderful books and magazines. I also teach online workshops that have been enjoyed by hundreds of artists and art lovers. 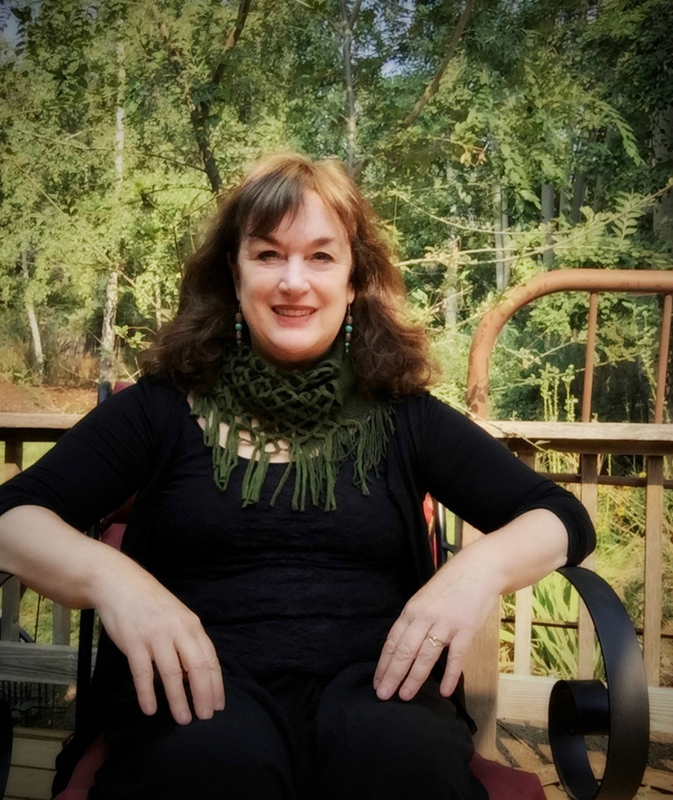 And I am an Adjunct Professor at Oregon Institute of Technology where I teach Mixed Media Art and Art Journaling. I believe that when we make art we are telling our own stories, and love watching them immerge, both in my own work and the work of others. Through my art, I would like to convey the feeling of connecting with nature and humanity, timelessness and hope. I especially love the Book Arts, Collage and Mixed Media. As an artist, I am constantly learning and growing. Art is my passion, my love, and my soul. Teaching enables me to share my passion…nothing makes me happier than helping my students through their own process of creativity. My goal is to help you find your magic! My book: Storytelling with Collage, was published in March of 2016 by North Light Books. And my newest book, Dancing on Raindrops was just released July 2017. The early registration price for this one week course (4+ hours of content) is $28.00. The price will go to $48 on October 14 @ 10am MST. You will have LIFETIME ACCESS* to the videos. This class will go live on November 13, 2017. 1. Register at jeanneoliver.ning.com (this is free). 2. Once your account is active you are able to take advantage of our free courses, series and even pay for courses. 3. 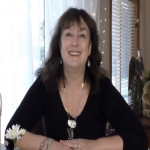 Go to jeanneoliver.ning.com and along the top header click on “COURSES” and you will be able to view all three pages of online courses and free series. 4. To purchase a course please choose your course, click on the +join in the upper right-hand corner, pay and you will be INSTANTLY in the classroom. 5. All videos can be found along the right-hand side of the page under “COURSE CONTENT”. 6. All of our courses are pre-recorded so you can watch at your convenience. The best part is that you have lifetime* access to all new purchases! Pretty awesome if you ask me. I signed up at the regular rate of $48 because I understood that that rate ended on Oct. 14 at 10am. Now I see that you are still offering that rate. What do I need to do to get the early bird rate? I signed up on the afternoon of October 14. Thank you! Robin, the early registration ended on October 14th @ 10 am MST. That is what this blog post states also. I am assuming you saw a new FB post by Roxanne where she links this post after the sale is over. I have let her know and she is editing her post. Thanks.